Below are seven ideas to hijack any habits which may be keeping you stuck. Join me as we celebrate the sweet victory of your chains falling to the ground, disempowering all that has been keeping you bound. It's time to get out of your own silly way. I flex my ninja power where the sweet meets the sour. This is your invitation to wake up. This is the tap on your shoulder, the unexpected epiphany, the whisper in your ear, the serendipitous encounter, and the sign on the side of the road that you have been looking for. 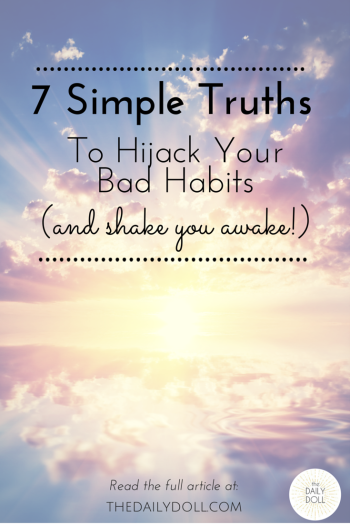 Below are seven ideas to hijack any habits which may be keeping you stuck. Join me as we celebrate the sweet victory of your chains falling to the ground, disempowering all that has been keeping you bound. It's time to get out of your own silly way. Some people are just existing until they die. Don't let it happen to you. Stop postponing your life by getting lost inside of your fantasies of the possibility of a better tomorrow. Your life is happening right now. Today. It is not next season, next semester, next year or, truly, even five minutes from now. It is not after your next promotion, once you are out of debt, once you have been rescued by your long-awaited prince, once a certain someone has accepted your efforts to make amends or once you've rebuilt your most devastatingly burned bridges. Your life is not lying dormant, lingering in some state of limbo or hibernation, waiting to begin once you've lost those 20 pounds or built those Instagram-worthy abs. This moment, as you are reading my words, is your life. This is where the power lies. It is calling for you to join in celebration of it. What are you waiting for? Stop hitting the snooze button. Refuse to take up membership in the society of the living dead. 2. If It Is Easy To Offend You, the Problem Exists Within You. If you're chronically offended by others' behaviors, the actual problem lies within you. People always release what they are filled up with. If someone's often knee-jerk reaction is to be displeased, it means they are secretly swimming around in a turbulent sea of misery. Hesitate before you take offense, for, when doing so, you're only sentencing yourself to a prison of resentment. I've known people who were offended if my face scrunched too hard when I yawned in their general direction. Then, there are those who are allergic to anyone who doesn't respond to their needs within a time frame fit for their self-serving standards. It is exhausting, and truly, quite unattractive. The world does not revolve around your agendas, your dramas, your problems, your victories, your expectations or your text messages. Stop looking for what everyone is doing wrong, and first take notice of what they are doing right. Otherwise, you're only creating stress for yourself and sabotaging potentially lovely relationships. Allow things to be good. It takes just as much effort to give a person credit as it does to assume they meant you harm or disregard. It takes just as much effort to smile as it does to snarl. Because if everything offends you, eventually, no one with a backbone is going to want to be around you. 3. What You Judge In Others, You Also Fear In Yourself. When I get brutally honest with myself, it is revealed to me that the things which irritate me most about others and provoke feelings of uncomfortable judgment are the things about myself I either wish to deny or wish desperately to prove. Perhaps their behavior calls to mind something I am terrified to lose. Perhaps it is something I fear of one day becoming, or perhaps it is something that reminds me of a certain shameful behavior from a time I wish to forget. The things which we are most judgmental of offer representations, perhaps indirectly, of things within our own lives that we are most afraid of. A person can only see that which is already awake in himself. So in order to be aware of something, you must first identify with it, or perhaps its opposite. Therefore, when you have compassion for others' shortcomings, you also give yourself the same courtesy in return. 4. Real Friends Don't Help Their Friends Hex Themselves. Instead of getting together with your friends to "whine and wine," how about getting together to talk about what is going right? Indulging in their dysfunction is not helping them create a better life. All you're doing is hanging out in the murky waters with them. Paint a different picture. Help them draw a new map. Redirect their route. Real friends don't let friends hex themselves by joining them to wallow in their swamp of problems. Throw them a rope. Send them a lifeboat. Remind them of reasons to smile. Just help them rediscover their joys. 5. Not Everyone Is Going To Like You, And It Often Has Little To Do With You. It has mostly to do with their perception of you within the framework of their perception of the world. Not everyone is going to give you a fair chance, understand your intentions or return the favor. Not everyone is going to meet your expectations of idealized behavior. Not everyone is going to think your endeavors are as spectacular and earth-shattering as your 82-year-old grandma does. Not everyone is going to be your cheerleader. The truth is, though, if you were to pull back all of the layers, it is of no actual importance whether you gain their approval or not. Underneath it all, you don't even really care. You just think you do because your ego is conditioned to believing it has something to prove. Don't let it fool you. 6. Your Excuses Are Cutting You Zero Breaks. We love our excuses, don't we? They pitch us dreams in our weakest moments. In our most shameful of scenarios, our excuses provide us with the illusion of relief. They are seductive. We are able to convince ourselves of why we have not done all that we wish we had. Our excuses allow us to rationalize why we should not apologize. We are able to dodge the discomfort of our shame by reverting the blame. In reality, though, they are cutting you zero breaks and are acting as invisible chains. If you consider all of the people you admire most in life, perhaps those who roar the loudest and seem to thrive effortlessly, you will likely be unable to attach to them any excuses at all. But, think now to those who never seem to pull themselves out of the ditch, those who continue to roll around in mud puddles year after year. You will likely be able to recall a string of their most famous excuses. It is always someone else's fault, and they remain cemented in the delusion of having fallen prey to the hands of those who have done them wrong. The stars never align for them, and the cards always seem to fall in such a fashion promoting only of their misfortune. They even have themselves convinced. Don't fall for it. Your excuses have nothing to offer you but a life of remaining stuck. 7. Every Day Is An Opportunity For Thankfulness. There exist countless individuals who wouldn't dream of going 24 hours without a shower, without ordering their triple shot caramel latte, without popping their antidepressant, without counting their money or perhaps without slathering some overpriced potion all over their face, yet they go weeks without expressing true gratitude for something. They don't even take a moment to marvel at that painted sunrise sky; they just sit outside spiritlessly gazing and thinking of all the things they are overwhelmed or unsatisfied by, all the while wishing they had more time. What is the point of medicating, preserving and preventing if you're not even living? Why does anyone need more time if they aren't really grateful for the minutes and hours they already have? Every second of life offers an opportunity for thankfulness. Gratitude is like engaging in a sloppy, wet and passionate kiss with all that is wonderful and lovely in this Universe that we have the luxury of calling home. Try it. Read the original version of this article by Lacey Johnson on The Daily Doll. If you enjoyed this article, click here for more like it.